The Irish Chain quilt is beautiful. Your Irish Chain is lovely. 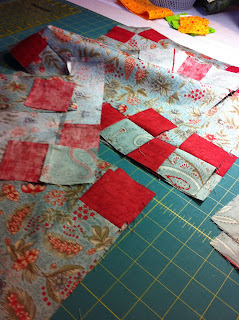 I love how such a simple pattern comes together to make such an incredibly beautiful quilt. Your friend Marie's rainbow Lone Star is breathtaking too. It sounds like a fun group to sew in! Fantastic projects, and you are one lucky lady to have quilting buddies!